Goniophlebium subauriculatum 'Knightiae' in the Fernery at the Morris Arboretum. Deciduous, 9 to 18 in. (23 to 45 cm). Zones 4 to (cool summer) 8.
description: In appropriately humusy soil, the rhizomes creep easily and widely. Smooth, brittle stipes are straw-colored and up to one-half of the frond length. Soft green triangular to pentagonal horizontal blades are tripinnate-pin-natifid. Six to ten pairs of pinnae have extended lower pinnules. Significantly for this species the innermost lower pinnules of the second pinnae pair are equal in size or longer than adjacent pinnules. The matching mate on the upper side is smaller. Round naked sori line up between the midrib and margin. 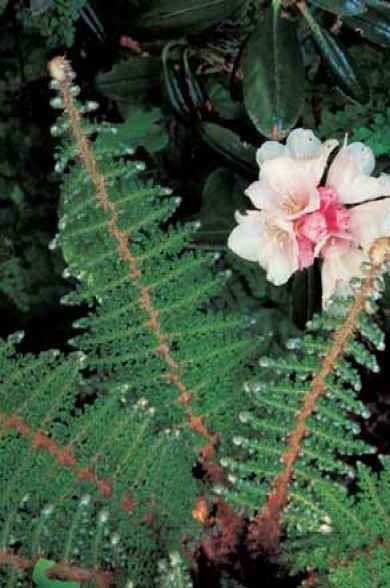 range and habitat: Look for this species in acid soil in moist coniferous woods, on streambanks and shaded rocky slopes along the Pacific coast of North America from Alaska south to oregon and slightly inland to Montana and Wyoming. Across the sea it can be found in parts of Russia, Sakhalin, and Kamchatka. indusia-free sori on Gymnocarpium oyamense. The pinnules and pinnae that are often used to make technical botanical distinctions between species of Gymnocarpium. and Linnaea borealis share cultural requirements and are handsome companions. Epithet from drys, oak, and pteris, fern. Deciduous, 9 to 12 in. (23 to 30 cm). Zones 2 to (cool summer) 8.
description: The rhizome is long-creeping especially in moist leaf mold. 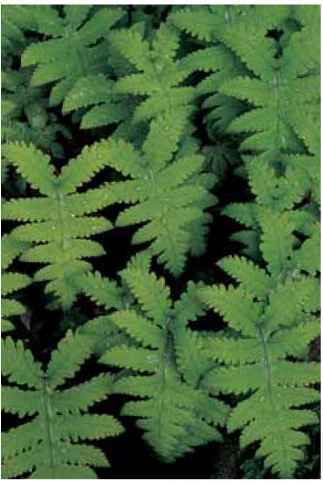 Grooved, delicate stipes are dark at the base and straw to green above and up to one-half of the frond length. 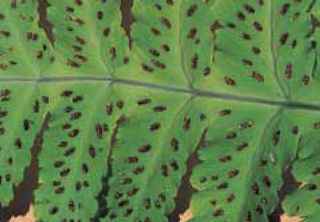 Horizontal, rich green blades are triangular to pentagonal and bipinnate-pinnatifid with 6 to 10 pairs of pinnae. The second from the base has lower inner pinnules that are somewhat longer than the adjacent, but the matching upper ones are the same size as their neighbors. Round indusia-free sori are in rows near the margin. Gymnocarpium dryopteris in the native garden at the Institute of Ecosystem Studies, New York. 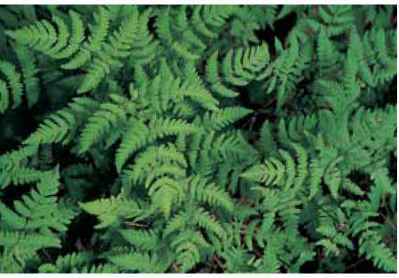 range and habitat: Oak fern is found worldwide in shaded acidic soil, wet seeps, and varied woodlands in cool temperate zones. culture and comments: In ancient times the revered oak tree had special status for its supposedly superb magical powers. 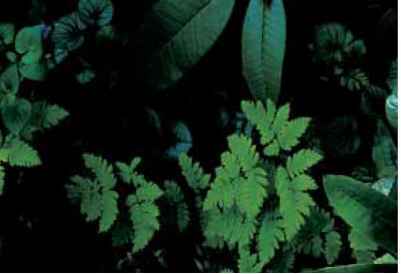 This species, being the oak fern, was likewise favored and credited with many wonders including preventing bad "spells" or offering protection from thunder and lightning when planted on roofs. The species has done quite a bit of taxo-nomic touring. By whatever name, it is to be welcomed for its light airy effect in woodlands and ease of maintenance given the basics of shade and composty soil. 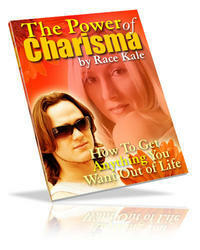 It does not adjust to the hot summers of interior climates. 'Plumosum' (feathery), with richly foliose fronds, is even more ornamental than the type and naturalizes in loose, shaded, woodland duff with equal ease. Epithet is after the Oya region in Japan. Deciduous, 8 to 18 in. (20 to 45 cm). Zones 7 to 9. Clusters of thin-textured, horizontal fronds of Gymnocarpium oyamense offer a soft component in the woodland garden. The leafy plumes of fronds on Gymnocarpium dryopteris 'Plumosum'. are long triangular and pinnate-pinnatifid with crenate, squared pinnule margins. There are 10 to 15 pairs of soft pinnae with the lowest pair pointing like downward wings away from the apex. Sori are oval and in multiple rows close to the margins of the pinnules and along the midribs of the pinnae. range and habitat: Originally reputed to prefer limestone habitats, I can find no documentation in either direction. (Unfortunately it is just as easy to repeat inaccurate information, as it is to confirm what is accurate.) I do know that my plants are happy in woodland soil, but based on the long-ago proffered advice are adjacent to a concrete foundation, which may or may not be significant. However, it implies that a little leaching lime will not be harmful. This species is native to Japan, China, Taiwan, Nepal, the Philippines, and New Guinea. culture and comments: An incredibly lovely species with a flowing soft texture, this is a high-priority plant for cool temperate gardens. Give it shade, regular moisture, humusy soil, and your admiration. Unfortunately hot summer climates are not suitable. Epithet is supposedly after this plant's resemblance to Geranium robertianum (an insult). Deciduous, 8 to 18 in. (20 to 45 cm). Zones 2 to (cool summer) 8.
description: The rhizome is long-creeping. 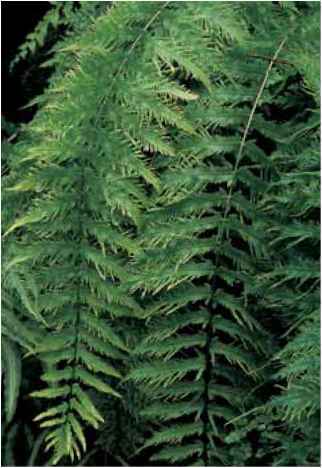 Tall pale green, grooved stipes are up to one-half of the frond length but usually of smaller proportions. Bipinnate-pinnatifid blades are triangular with 9 to 12 pairs of pinnae; the lower pair are similar to those immediately above. The surfaces and structure are covered with minute pinhead glandular hairs so small that they would make a grain of salt look like an iceberg by comparison. Sori without indusia are round and close to the margins. range and habitat: Here is a truly lime-loving species that is circumboreal wherever the proper habitat permits. it grows in partially shaded calcareous swamps, rocky limestone slopes, and even on walls. culture and comments: An excellent choice for a limestone cobble, this species will tolerate some sunshine but not drought. 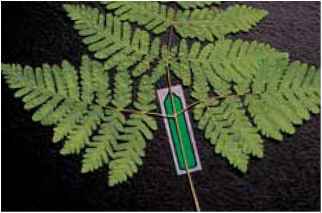 What is a fern epithet?